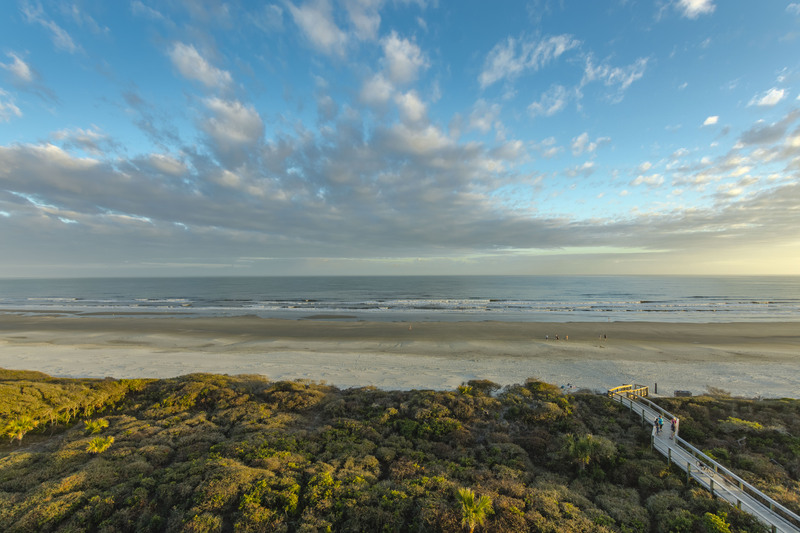 The beautiful ocean views from this fifth floor luxury Kiawah Island oceanfront vacation rental, located at 5135 Windswept Villa, can be enjoyed from almost every room in the villa. This completely renovated, 2 bedroom villa has crown molding, bead board from the foyer to the living area, beautifully framed windows and doors, tiled bathrooms, granite countertops in bathrooms and kitchen, detailed cabinetry and fixtures, stainless steel appliances, and received all new furniture and bedding in 2018. When you enter the foyer your eyes will be drawn straight through the villa to the ocean views. To the right is the guest bedroom with 2 twin beds, wall mounted flat screen TV, carpeted floors, and access to a bathroom with a tub/shower combination and single sink. This bathroom can also be accessed from the hallway. Down the hall to the left is a fully equipped kitchen with pretty white cabinets, stainless steel appliances, large side by side refrigerator, and a deep sink. 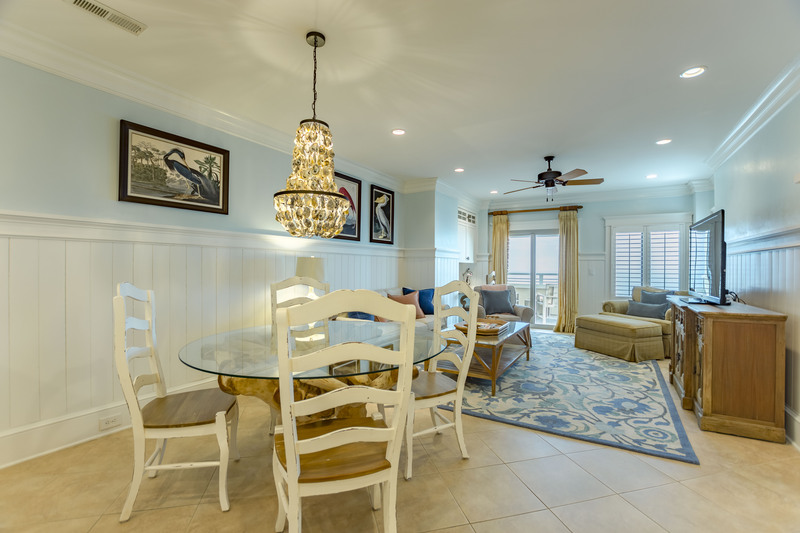 The dining area with round glass top table has seating for four, an oyster chandelier above and is open to the living area. The main living area has tile flooring and comfortable seating on a large sofa, multiple chairs, large flat screen TV and a built-in desk. 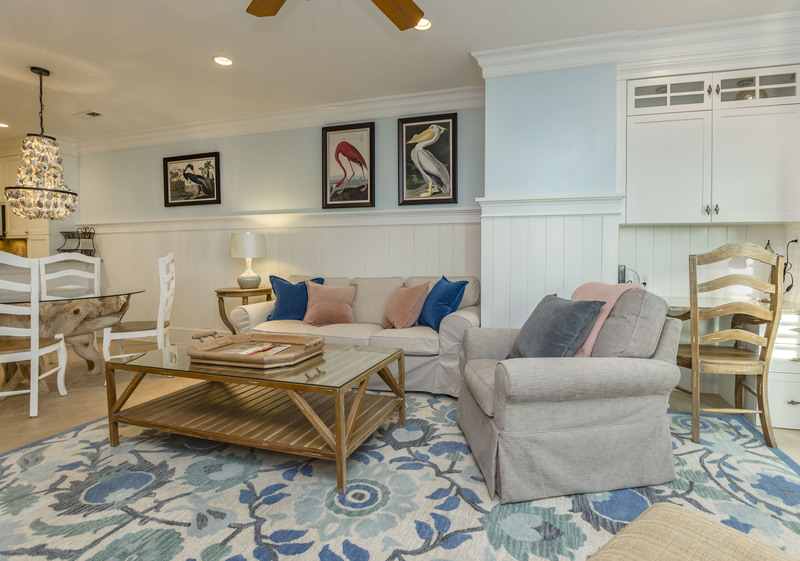 Through sliding glass doors in the living area you can step out onto the covered deck with 2 seats, where you can enjoy the ocean breezes, watch the beachcombers, and simply relax. 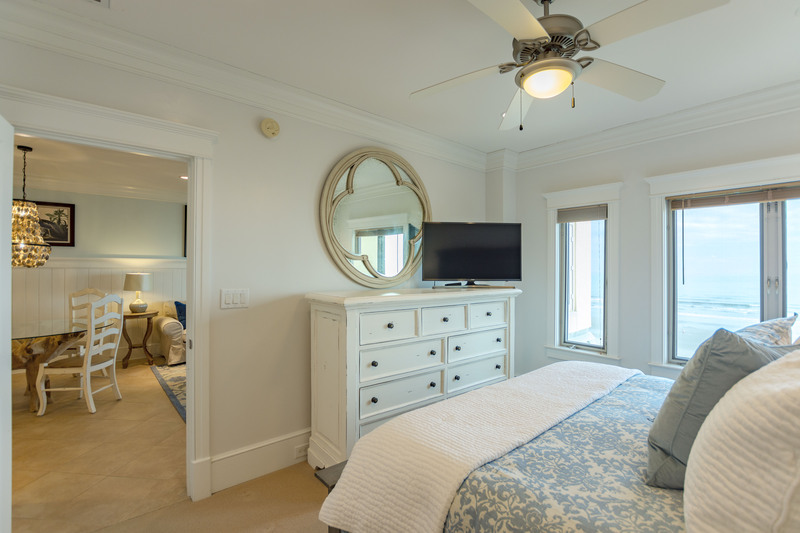 The master bedroom offers these same views of the beach through a wall of windows. This bedroom has a king size bed and flatscreen TV. 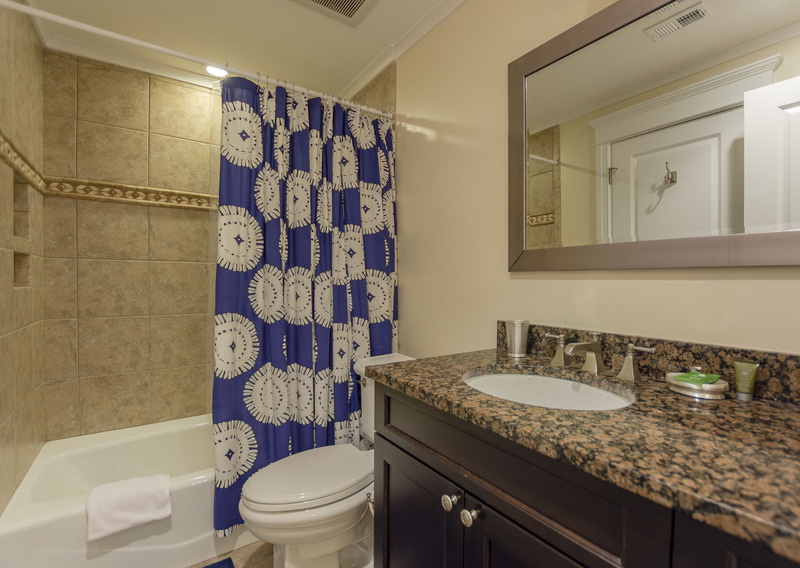 The private master bathroom has a large double sink vanity area, a huge walk in shower with granite seat, rain shower, an additional shower head, and beautiful tile. The villa has a washer, dryer, high speed wireless internet and an upgrade cable package that includes HBO and other movie channels. Was great. Good location on the beach. Great view. Unit was immaculate, kitchen had all necessary utensils, king bed very comfortable, lots of hot water and water pressure, WiFi good, tv had Netflix, quiet, lots of biking on trails, close to entrance, good timing during restaurant week. A great location and well maintained! BEST VACATION EVER. DIDN'T WANT TO LEAVE. BEAUTIFUL CONDO WITH ALL THE AMENITIES.FELT LIKE HOME. we LOVED Windswept Villas! The place was clean and welcoming. The ocean view was beautiful! We felt very much at home here. A very peaceful and relaxing vacation. I highly recommend! Kiawah Island, my favorite vacay destination ! Walking, biking, beautiful scenery, great food, a good book inder a beach umbrella. Property description was accurate. The 5th floor condo was very clean, comfortable and well maintained. We enjoyed the restaurants at Turtle Point Golf Clubhouse, the Ocean Course (call for reservations) and the Night Heron Grill at the resort, as well as, King Street Grill, LaTella Pizzeria in Freshfields Village. Magnolia's in Charlestown on East Bay St was excellent. We also enjoyed dinners at McCann's Irish Pub just on the right before the entrance to Seabrook Isand and Fischer's Sports Pub . The condo was completely renovated this year - everything was beautfully done. We have stayed in this condo before and love the view of the beach and ocean. Plus convenient location to shopping, golf course, etc. We will definitely return to Kiawah and rent this facility again - outstanding experience. Rented 5135 Windswept again this year. Love the updates to the kids room and bathroom. Also the new taller table and chairs on the balcony. 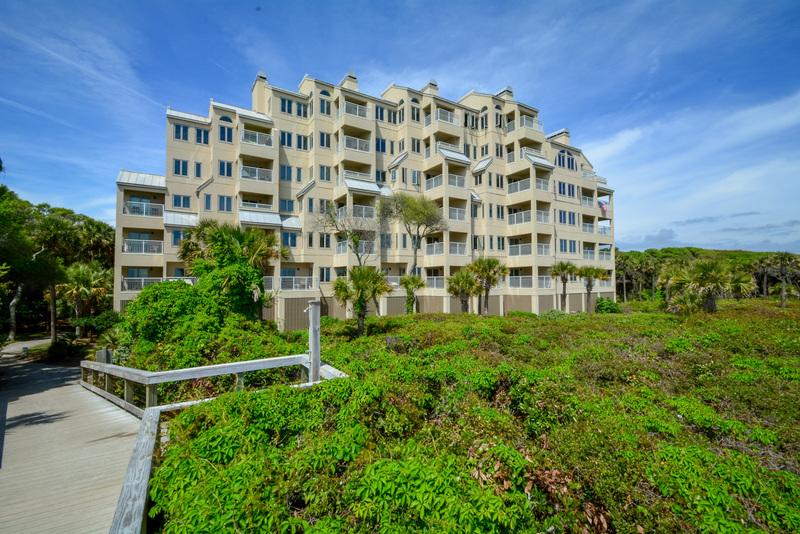 Overall one of the best two bedroom units on Kiawah. This oceanfront condo is a beautiful, tastefully decorated condo with very comfortable furniture, including the beds. Televisions were updated & top notch. Kitchen is adequately stocked with cookware. We'd certainly rent this condo again. We totally loved our visit to 5135 Windswept. We have stayed in other rental units and they were not as clean or as well kept as this one. We had no issues and loved the view and the amenities offered in the unit. We would definitely return again. We had a great time! Windswept 5135 is a nice little condo with a perfect view of the beach. All the furnishings are up to date and very nice. We had an awesome time on Kiawah and the condo unit was terrific. The unit was clean, comfortable, well equipped and a great view. We enjoyed our stay at 5135 Windswept and only wish we could have stayed longer. Waging machine did not work on the "normal" cycle. Furniture is a bit formal for our taste. Would prefer high table and chairs on the deck to be able to see over the rail. Overall we were very happy with our condo. It was well furnished, very clean and had a beautiful view of the ocean from our balcony. The only improvement I would suggest is that it is time for some new mattresses. The current ones are quite worn. The living room couch was a bit "sqaushy" too but it was a sofa bed. But otherwise it was just perfect. This was our first time in Kiawah. This 5th floor condo was in a perfect location. We enjoyed the views and listening to the ocean. The villa was adequately stocked. Bathroom and kitchen updates were very nice. The living room furniture could use an upgrade, the couch especially. Additionally pillows and towels could be improved, but overall we were very satisfied. The experience was great. The one item I would say could be improved is the elevators. They were a bit slow and there was one that was out for a full day we were there. Otherwise, stay was lovely! other than not getting the 70 degree weather you promised, the unit and location was terrific. My husband and I stayed at this lovely villa for our one year anniversary. It was so comfortable and the views are beautiful. The bike storage was very convenient, and Akers Ellis is such a great company to book with. Their app had so much useful information and made check in and out a breeze! I will definitely tell friends and family to book with you. Villa was beautiful & had great views to the ocean right in front of us! Kitchen well stocked as we made dinner most nights due to a baby with us. I would highly recommend unit & Akers Ellis as a rental agency. They were very quick to respond to a couple of emails I had sent. Thank you for a great experience, no disappointments. 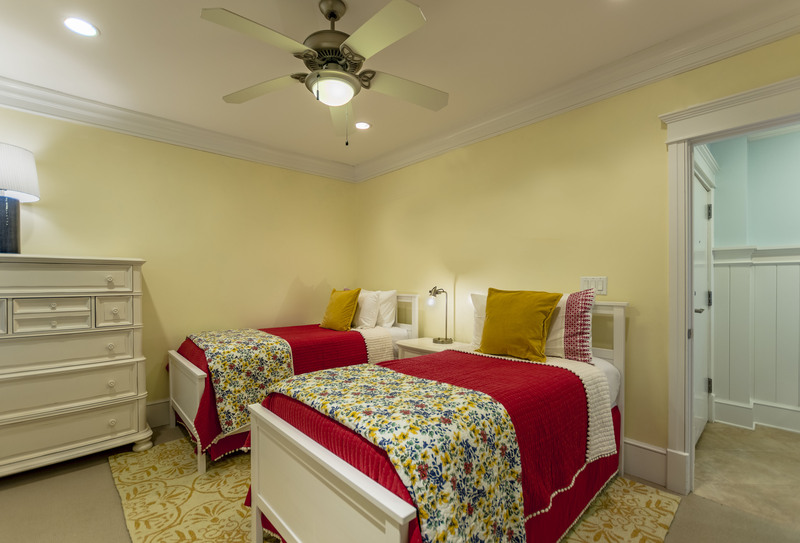 We had originally booked a cottage on Kiawah Island and when the condition was not what we expected, we contacted Akers Ellis and they immediately addressed the situation by offering the Windswept Villa. The view was spectacular, the condition excellent and the amenities perfect. We would love to have stayed longer and will plan to stay with Akers Ellis again. furnished, all the conveniences one would need. We had a wonderful time being so close to the beach. The stay was wonderful and the property was great! We enjoyed our vacation experience at 5135 Windswept. We do have one suggestion: seating for at least 4 on the porch. We'd suggest a bar table with 4 bar chairs, to enable easy viewing of the beach. We enjoyed our stay very much. The condo was very clean and had everything we needed. Your staff was also very helpful when I made reservations. Five stars! We look forward to a return trip and we'll use Akers Ellis again. Thanks so much. Vacation was very good, and the condo was a 4+. Your firm has been very helpful. We may stay longer next year. The condo was beautiful...the finishes were lovely. Everything exceeded our expectations for a rental property. From the wireless Internet to the great masters suite and master bath...I would definitely recommend this unit to everyone...and when we come back...this will be the unit I will rent. Its always sad to leave Kiawah...but we had a fantastic time at 5135. Please thank everyone for us and we appreciate their thoughtfulness. We loved the unit and great view of the ocean. I would rate it a 5. Thanks again. The villa we stayed in was fine. The furniture is a little older, but it was comfortable. The villa was very clean and the view is great. We stayed in the same villa last year. We were very satisfied with the condo. The condo was beautiful. Top quality everything! Loved it! We enjoyed staying in that unit once again. We had a great time and really enjoyed the rental. My wife and I very much enjoyed our stay. It was our first trip to Kiawah, and it is most certainly a do again. The Villa was very nice, and well appointed for a unit that rents to the public. It was wonderful and I'd rate it a perfect 5! I'll be back and hope to reserve the same villa. Thank you all for all your help! The condo was great. We really appreciate all the great service! We had a very nice vacation. As always, we had a fabulous time. We were amazed with the weather in May- low humidity, no rain- perfect conditions! We love the Windswept Villa. We would certainly stay there again! This was our second stay at this particular villa and we love it. Thank you again! We can't wait to come back! Considering the destination Kiawah, the company's expertise in leasing operations, and finally the condo, I would give a 4+ rating overall. Some floors seemed a little dirty, but the balance of the condo was very clean! We are definitely onboard for another visit next year. Thanks for everything. Overall, great location, clean unit, etc. Our family really enjoyed it, and the app you guys have is a fantastic idea. We enjoyed our stay at 5135 Windswept. It was beautifully furnished and clean. Overall, it was very nice and we were very comfortable. We have stayed in that Windswept building for the past six years. The unit was lovely and we truly enjoyed it! Another plus was the information in the unit (notebook) about places to eat in Charleston and other various information (phone numbers). This was the best place we have stayed. I have passed your website along to a couple of folks and we hope we're able to go back next year ... thank you! It was a 5. If you could have turned the temp up on the beach, it would have been a 10. We definitely want to come back and visit longer. Who knows, perhaps a place to buy. We had an absolute lovely time while staying in your condo!! Lovely place with a great view! Thanks for working with us on the dates of our vacation. Hope to be there again next year, maybe two weeks this time!! I would definitely give it a 5. We had a great time in a wonderful property! Thank you!! Excellent experience. The villa was very nice as always. It is our pleasure to rate Akers Ellis a 5 in every aspect. We appreciated the app that allowed us to access all the info we needed regarding our rental, Taylor West was extremely helpful with our questions and special request, and our Parkside Villa was extremely clean and perfect for a long weekend vacation. It was our first time visiting Kiawah during the month of September. We enjoyed it so much that my husband actually commented that we should plan a two week vacation to Kiawah next September. I am already making plansJ. Thank you for helping to make our Kiawah visit a relaxing, memorable experience. We would rate it a 5. We are looking forward to another stay this fall or next spring. We had a great trip! Property was great! We would rate the experience with a 5! Our vacation experience was a 5. We had a wonderful time and the rental was beautiful. We wanted to let you know that we had an amazing time and loved the condo. We would rate it 5+. The team at Akers Ellis gets a strong 5 from me. They were a pleasure to work with. If/when I come to Kiawah in the future, I will be sure to connect with your company first for rental availability. The elevator temp. was well over 100 degrees. Use of energy saving bulbs wouls save money and reduce heat build up. There are no serving plates in the condo. A luggage cart to help on check in and check out days would be VERY helpful. Have stayed on the island many times and the view from 5135 is among the best. Property was in excellent condition. It had recently been refurbished. Everything was new. The view of the beach is perfect. The access to the beach is easy. We will return! We had an incredible week at Kiawah while staying in this wonderful Villa! 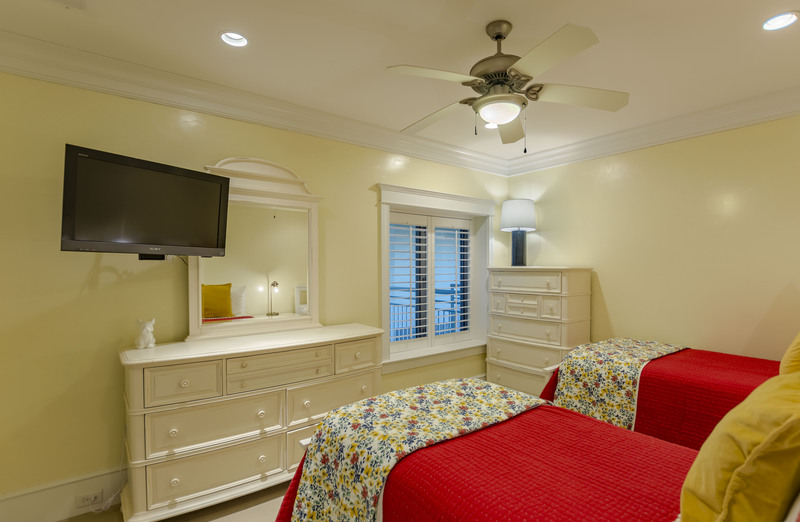 As the description states, it has been fully remodeled top to bottom and beautifully done. We can't say enough about it. The location within Kiawah is perfect, and the views and the breeze on the 5th floor balcony were incredible. Selfishly I wish I could send you somewhere else so this beauty stays perfect for our next stay, but i can't do that. Additionally, the property management firm was very easy to deal with during the rental process and very responsive to minor requests we had during our stay. We hope you enjoy as much as we did! Wonderful location and property! We were very pleased. We would definitely recommend the property. Thoroughly enjoyed our stay. Unit is totally renovated & furnished. Top notch. Highly recommended. Perfect location, perfectly clean, great porch, very comfortable. Loved it! Would go back in a heartbeat. Great value! Very deluxe...I mean who watches TV in a mirror? How fun! Great week to remember. This condo is Great! From the decor to the appliances all first class. All of the amenities you could want. It was our third visit to Kiawah and we will definitely stay here again. Would definitely recommend this condo. Great condo, with an excellent renovation job and great views. Interesting decor in the bedrooms, but don't be put off. This is a very nice place! Top notch condo on the beach! The unitwas beautiful and the pictureson the internet didn't do it justice. The location was perfect and so accessible to the beach and boardwalk. The unit was stocked with everything you needed from kitchen items to linens and towels. The decor is all updated and beautiful. We will be back in June and hope to stay at this same unit. Thank you! It was excellent!! The Villa was very nice, the ocean views were breath-taking. The grounds on the property beautiful. Everything in the condo was wonderful. Great kitchen and appliances, beautiful ocean view from the master bedroom and balcony. 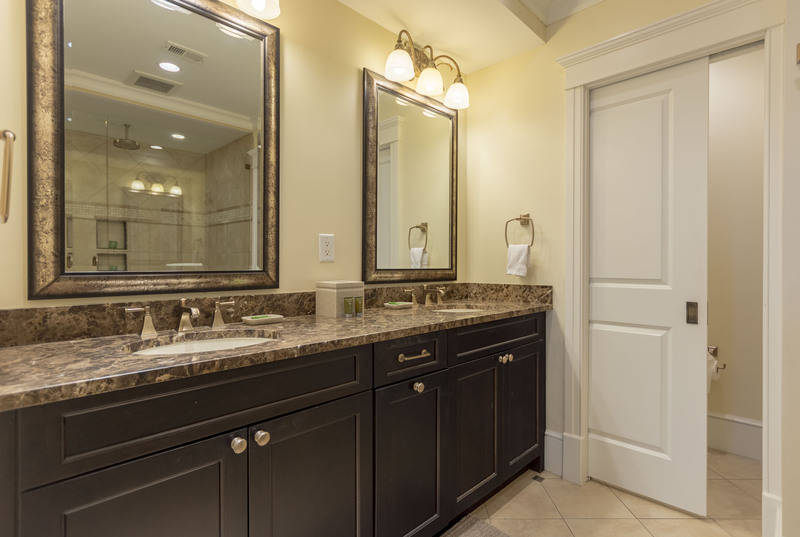 Bathrooms are completely updated and pure luxury. Enjoyed our stay, wish the weather would have cooperated...chilly and windy. Had a problem with the AC but Akers property management addressed it quickly and professionally. Great place. Would like an option for use of pool. The rental property was beautifully decorated and comfortable. The sound of the ocean from the master bedroom is sooo relaxing. The king bed was very comfortable and the shower was amazing! The property was in excellent condition a few minor hiccups ! Loved the view and the property! We are already planning another stay and hope we can get the same property or another with this company! Very professional and so on top of things! Loved It! Awesome - Selfishly reluctant to share such a great place! Truly a superior rental villa property. Ideal location to all island amenities. 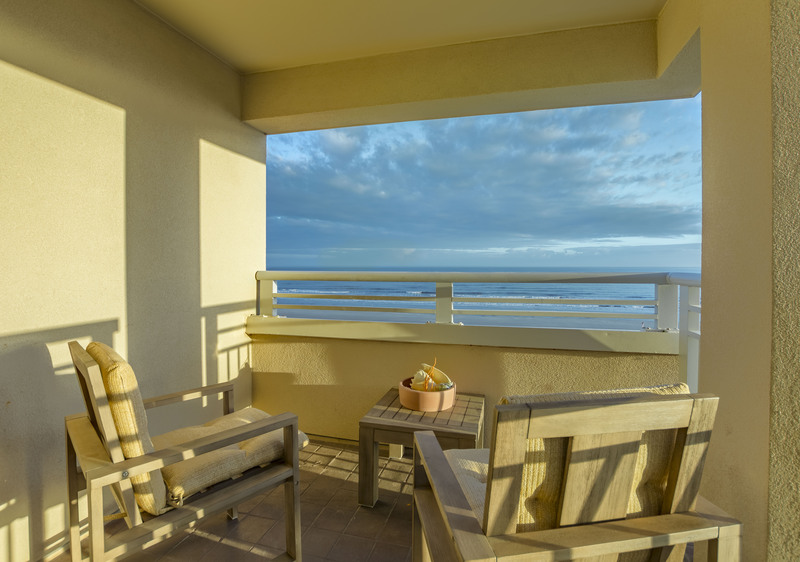 Commanding views of the beachfront. Wonderfully appointed kitchen with all conveniences. Fantastic master bath, and a great night's sleep. Keyed and coded entry system could not be easier, nor safer. Definitely on our return list. One week never enough at Kiawah ! A terrific property in a great location with a fantastic view of the beach, and within a short walk to the Sanctuary for their famous Sunday brunch. Highly recommended. The villa provided everything we needed. 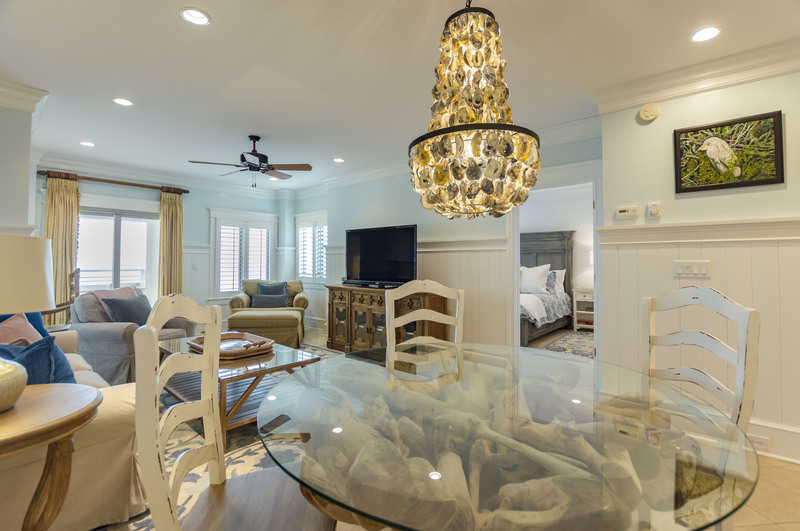 We will definitely return to Kiawah and look forward to renting that unit again! We enjoyed our stay at 5135 windswept. In fact we have also reserved it for a stay in July. Our overall rating would be a 5 in regards to service and the condo. The renovation you have done is excellent. It is a great place! We had a great experience and will use you again, as well as refer to friends and family. We really enjoyed our stay. Our condo was great. A great unit and easy rental process. I really loved this condo - it was beautiful and had a beautiful view of the ocean from the master bedroom. The rental property was nearly perfect. The kitchen, bathroom and living room were superb. All in all, we’d definitely stay at the same rental property again. The pictures did it justice, the proximity to the beach was perfect, and we loved the quiet of the area. Thank you and we will definitely keep your company in mind for future vacations. We, as always, had a fabulous time vacationing on Kiawah Island. Our villa was incredible and we enjoyed the balcony with the beautiful ocean view. We hope to stay in this villa again! We enjoyed our stay at 5135, which was part of a larger family vacation involving our collective rental of 4 condos.